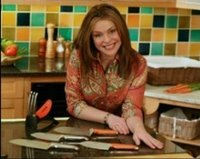 I ran across this video where Rachael Ray discusses her Furi knives (please don't make fun of me for randomly finding this stuff - I already know I have issues). The marketing video includes her discussion of which knives she uses and how she found Furi. They are an Australian company that she found because of their knife sharpening tools. Rachael says that the orange-handled Furi Gusto Grip line is her favorite and that she was very involved in the design of the knife. Apparently, her wrists have begun to hurt from all the years of chopping and she wanted a lighter knife - so they made one for her! She also wanted a knife that had a "grippier" handle so that it would not slip when wet. Rachael's honest and straightforward style comes across well in the video - she even mentions that she uses the more expensive Coppertail line of knives only on special occaisons and that she prefers the less expensive Gusto Grip line.